Specifically, it’s the Memorial Park’s inspiring Family Services & Administration building, designed by resort architect George “Pete” Wimberly and built in 1965, that we’re singling out here. Designed to resemble a Hawaiian heiau (temple) this evocative concrete and wood structure sits atop a lava rock platform with graceful squared-off arches that seem to be reaching for the heavens. 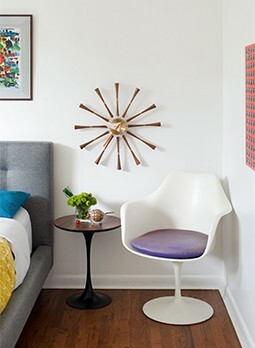 It effortlessly displays how mid-century modern architecture can transcend itself and become more… much more. 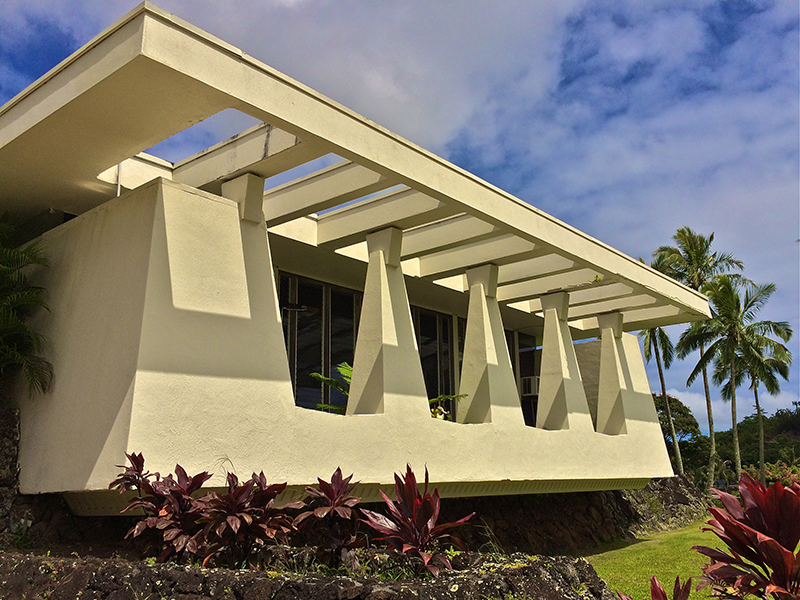 For a time, this architecturally significant structure was in danger being bulldozed in favor of larger and more contemporary digs, which led the Historic Hawaii Foundation to list it as “endangered” in 2014. 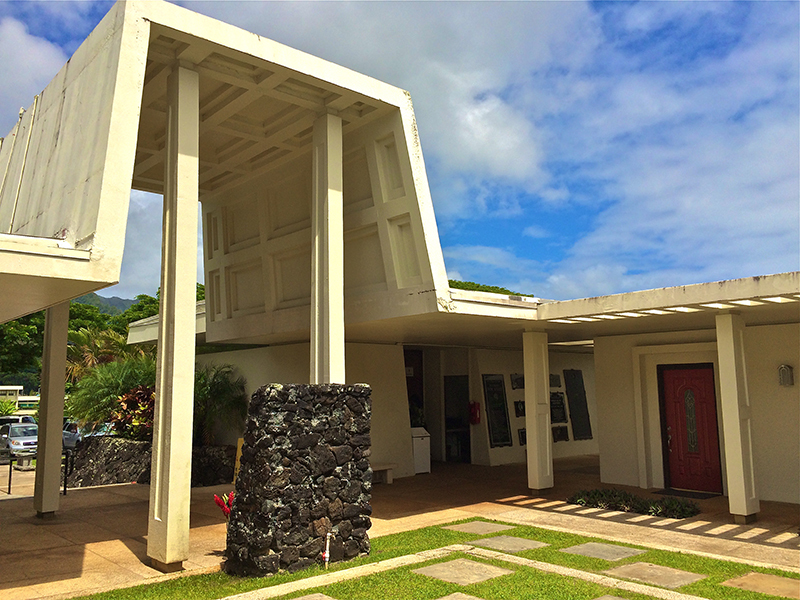 Its owner, Northstar Memorial Group, working with the Historic Hawaii Foundation and the community, opted for preservation and expansion rather than demolition, and are currently in the midst of enclosing the structure’s central courtyard which will nearly double its existing 5,700 square feet and add room for a new chapel. 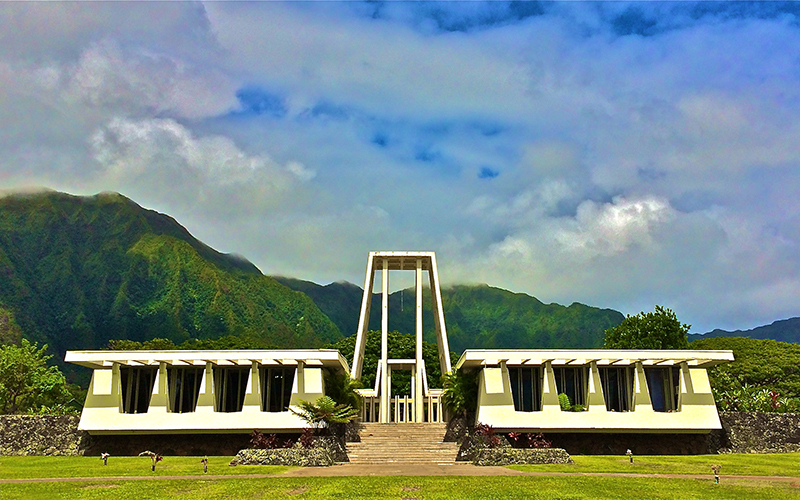 Designed by architect George “Pete” Wimberly, the Family Services/Administration building was inspired by the Native Hawaiian heiau (sacred temple). The structure sits atop a lava rock platform, keeping it grounded, while other design elements encourage the viewer to look upward. The Valley of the Temples Memorial Park is also home to the much smaller Trousdale Chapel. With its modernist take on the popular church A-Frame, it is also exquisite and, not to be overstated, a revelation, set against the backdrop of the beautiful Ko’olau mountains. Ken MacIntyre is the creator and curator of Modtraveler.net, an Enthusiast’s Guide to Modernism. For more photos and stories of modernist destinations visit his website or follow Ken on Instagram@modtraveler. As part of the building’s expansion plans, this central courtyard will be enclosed while its squared off A-frame elements are retained.